Clarence Charles "Short" Cushing (March 4, 2008) | Burmeister-Johannsen Funeral Home, Inc.
Clarence Charles “Short” Cushing, the son of Charlie Andrew and Lizzy (Boeck) Cushing, was born on March 14, 1914, on the family farm located three miles northwest of Shelby, Iowa. He graduated from Shelby High School in 1932, and moved into Shelby in 1935. Short did various jobs, including working as a school bus driver. On September 16, 1939, Short married Darlene Virginia Eckel in Council Bluffs, Iowa. The couple built a home in Shelby and enjoyed living in the same house until very recently. 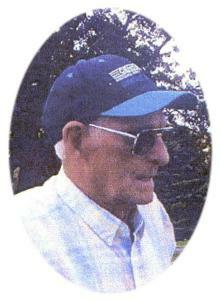 From 1947 to 1966, Short worked as a tractor shop mechanic for Kiesel Implement. He purchased that shop and renamed it The Cushing Garage; he ran the shop until his retirement in 1976. Short then occupied his time by keeping a large garden; he was known for his production of quality raspberries and black walnuts. Short was a member of the United Lutheran Church in Shelby, and a 50-year member of the Shelby Volunteer Fire Department. He had served as the Fire Chief from 1943-1968. Short loved to travel and visit his children and grandchildren. He spent time solving crossword puzzles, putting together jigsaw puzzles, and playing card games, especially the old German game, Schafkoph. He also enjoyed the outdoors and liked to hunt, fish, and trap. Clarence C. “Short” Cushing died on Tuesday, March 4, 2008, at Myrtue Medical Center in Harlan, Iowa, at the age of 93 years, 11 months, and 19 days. Short was preceded in death by his parents; his wife, Darlene, on February 6, 2008; one brother, Wilbert Cushing; and one sister, Ellen Robacker. He is survived by one son, Barry (Carol) Cushing of Meridian, Idaho; one daughter, Judy (George) Huckins of Kansas City, Missouri; one sister-in-law, Dorothy (Lewis) Muzzy of Spring Valley, California; six grandchildren; 14 great-grandchildren; one great-great-grandchild; and other relatives and friends. Funeral services were held on Saturday, March 8, 2008, at the United Lutheran Church in Shelby, Iowa, with Pastor Duane Anunson officiating. Nancy Armstrong served as the organist, and Lee McKnabb was the vocalist. Casket bearers were Eric Carter, Scott Huckins, Clayton Cushing, Christi Carter, Troy Huckins, and Andrew Cushing. Burial was in the Shelby Cemetery in Shelby, Iowa. Memorials may be directed to the United Lutheran Church or the Shelby Fire Department. The Burmeister-Johannsen Funeral Home in Shelby was in charge of the arrangements.